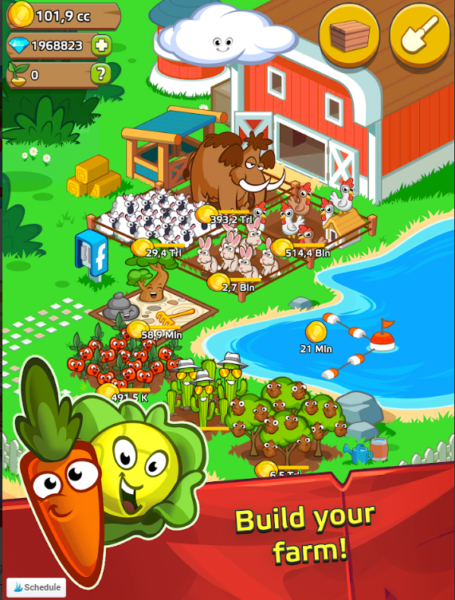 Idle games or idle clickers were inspired by a game called Cow Clickers which was released in July 2010. 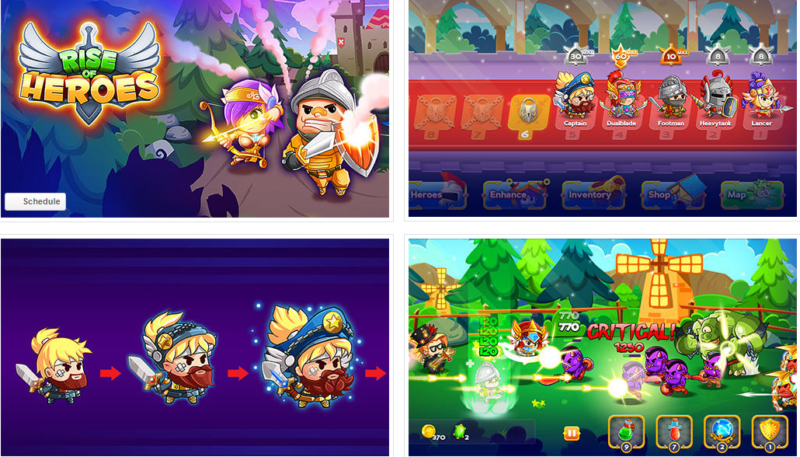 Since then, many new idle games have surfaced and became really popular on mobile phones. There are plenty of idle games these days both on Android and iOS. Here are some of the best idle games for your mobile phone. This game is all about farming, so if you don’t have your own garden, maybe get a virtual one. It’s not like other farming games, because it has some weird elements in it. For starters, you can even grow your own unicorns and dragons! Great art and animation for a pleasing visual experience. You can grow seeds, harvest, cultivate potatoes and other crops. All you have to do is keep tapping! There are a lot of upgrades in the game to spruce up the gameplay quality. Otherwise it gets boring. As it’s an idle game, all you have to do is keep tapping to collect puzzles, cultivate crops, grow stuff and harvest your crops. There are also swiping functions on top of it. Who should play this: Those who love mindless farming. 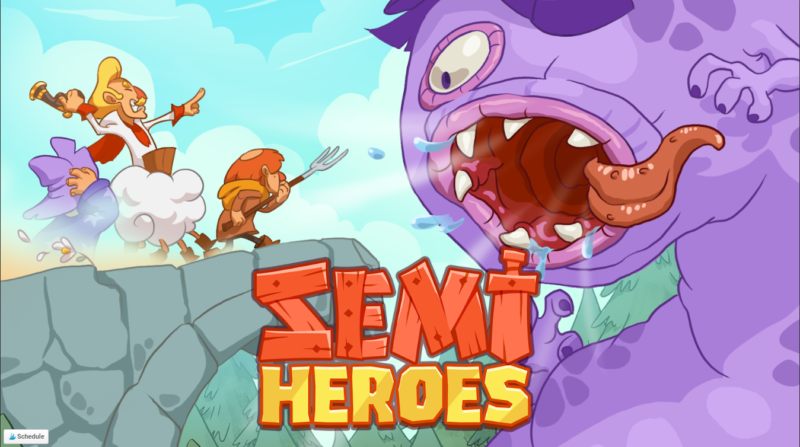 Semi Heroes is a game where you have to rescue the world from evil monsters who took holy trees. Here’s the funny plot, these monsters use trees to cook for oil. Makes sense? Anyway, since it’s an idle clicker game, who cares about the plot, right? All you have to do is keep tapping to win. Plenty of battles that take place across different realms. Only requires tapping or clicking to beat the monsters. You are able to change idiots into heroes and unleash their hidden skills. Sounds cool? Very unique drawing style of the characters. Plenty of quests and missions to take part in. This game is suited to those who love becoming zoo keepers. It’s a zoo simulation where you can raise your own animals and upgrade them to improve birth rate plus value. You can also re-sell them for a profit just to expand your business. All of this is done by tapping. Bathrooms and food stalls can also be built to attract more people to your zoo. Soon enough, you’ll be building aquariums and safari rides. Build your own zoo. You can customize it according to your liking, with decorations, fun rides and animals. Raise your animals. 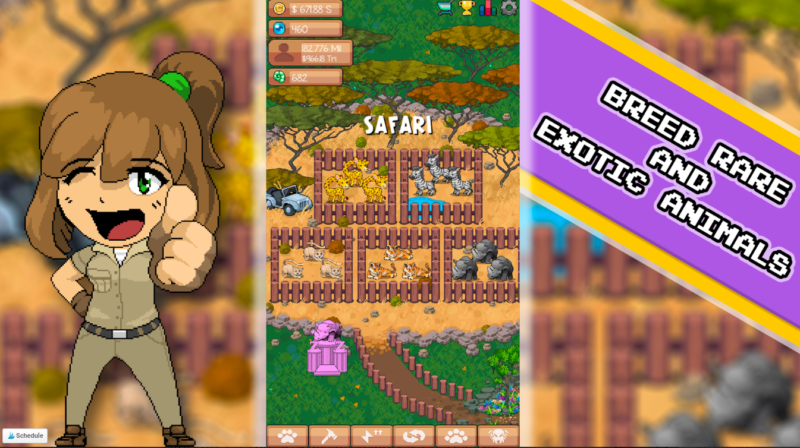 You are allowed to buy and sell zoo animals, stock your food, upgrade animals to increase value and survival rate, or even trade your animals for gems. You need gems to upgrade your zoo and improve on your progress. Expand the zoo. As mentioned above, you can do many things with the zoo and sell animals for money to expand the zoo. Idle progress. This means you only have to tap or click to play the game. Furthermore, the zoo grows when you’re offline. Clicker Racing is a game where the aim is to be the greatest racer ever, by overcoming thousands of other rivals and explore different tracks. You still start as a newbie with an old car, and you’ll slowly upgrade along the way. Literally thousands of race stages where you can play. You can also recruit racing crew and technologies along the way. 6 different cars with benefits to unlock. There are 8 hand-crafted wonderlands in this game. To defeat rival cars and big bosses, all you have to do is tap. 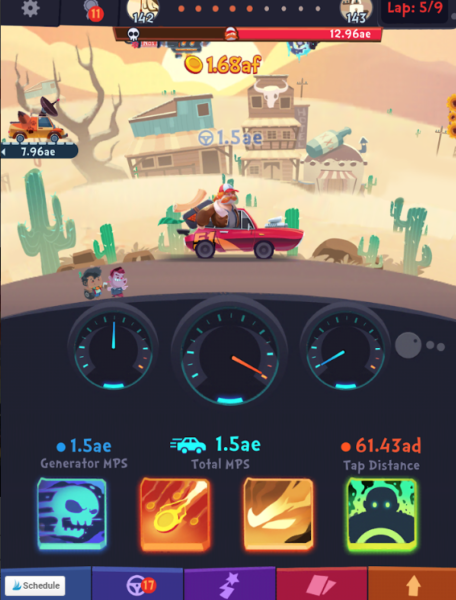 Collect speed-boosting cards and discover magic tools to improve on your car. Daily rewards, cloud save and prestige feature. You can even get idle gold when you’re not online. There is nothing much to say about this game except that it’s all about zombies. 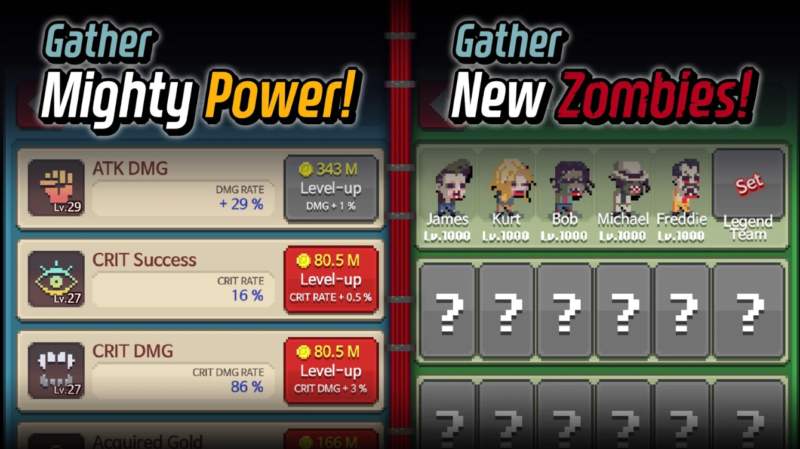 You can merge and level up zombies, defeat monsters using zombies and do it all again if your zombie dies. It has over 900 stages, 70 monsters and 60 zombies in the game. All you have to do is click and tap to bulldoze through the game. Another idle game to check out is Rise of Heroes. It’s about recruiting and using heroes to defeat the darkness and also compete with other teams. You can conquer places to upgrade your heroes, evolve them and even unlock new lands. Apart from that, you have side events, secret dungeon explorations and the World Tournament to look out for. A huge collection of weaponry and rare weapons have special abilities. Over 30 heroes to choose from, and is divided into 4 classes, i.e. healer, supporter, killer and tanker. You can use special items during battles and also coins to upgrade heroes. Loads of insane bosses to challenge along the way and prove yourself during the World Tournament to earn valuable items. As it’s online, you can team up with your friends to go against a super boss. As the name suggests, you can have multiple factories that produce awesome stuff. Your job is to build workstations in those factories as well. You play as the operator of the factories and you have to automate workflow by hiring managers. This will enable your products to be sold automatically. The great thing is that your factory runs when you’re offline, so if your machines and productions are awesome, your income increases. 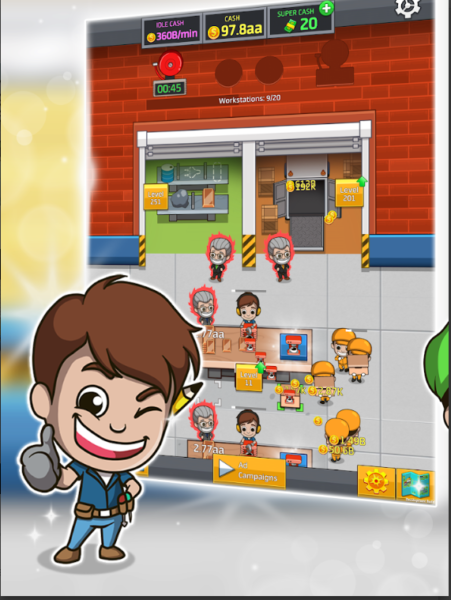 Manage your factories and automate workflow to get more cash. Invest more cash to upgrade items and boost income. Hire managers for the workstations. You can have up to 20 workstations in each factory. Internet connection is not required for this game. There will be in-app purchases in the game. 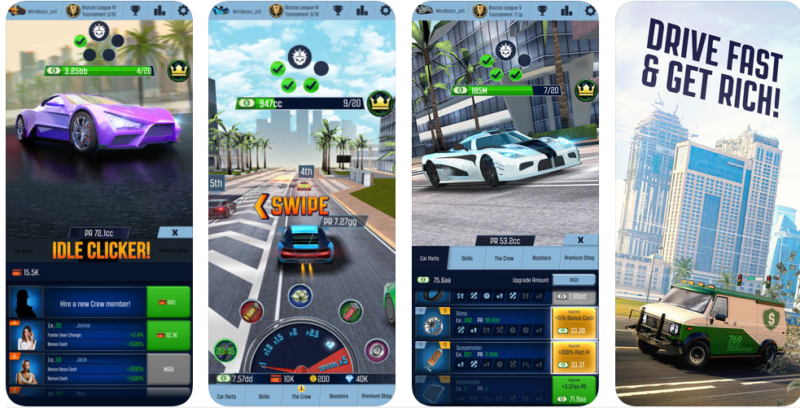 If you’re tired of regular racing games, do check out idle racing games like this one. Tap faster to speed up, collect bonuses for nitro packs and win your races! There are over 20,000 opponents to race with in different leagues. Over 45 upgrades to tune your car with. It’s basically an illegal racing that is held on real traffic, so you may have huge obstacles. Collect cars in your garage. Exceed the high score and be one of the top in the online leaderboards. You can also hire crew members to improve on your performance. Its graphics and the ability to race with just tapping makes it one of the best idle games in 2018. This is a unique idle apocalypse game where you can do anything to cause the end of the world. You can summon hordes of goblins, beasts or even monsters. Use spells to defeat any heroes who try to stop you. You can also summon legendary idols to bring the end times. All of this is done by tapping! 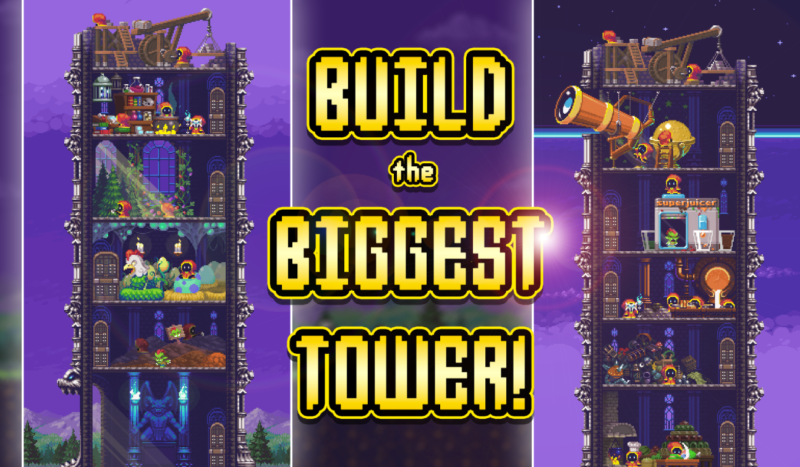 You can craft towers that are seriously high. Create over 20 different monsters. Build mines, kitchens, factories and so on. Even if you’re offline, your monsters keep fighting for you. Do note that this app may be unstable for some phone versions, so do be warned. Yes, plant your own weeds with this unique idle game that’s probably not for kids. 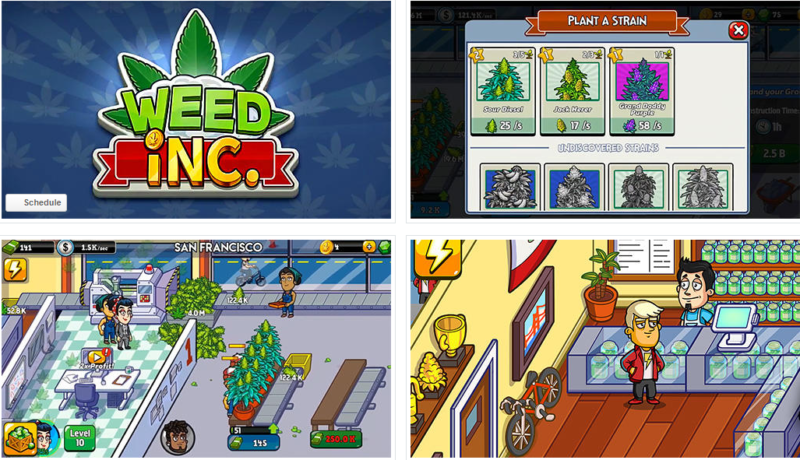 You can collect and upgrade various weed strains and manage their growth, up until they’re big enough for selling on your storefront. You manage your rooms, i.e. Dispensary, Grow and Processing. Earn crates to unlock rewards and collect new strains or upgrade existing strains. Hire manages to improve on production. You can even expand your business to LA, Seattle and New York. What are the best idle games for you? Do check out some of the top idle games mentioned above if you love this genre. What are your favorites? Are they even listed above? Do leave your comments below if you have other awesome suggestions. Is RuneScape Dead In 2018? What Are Your Thoughts? Clicker Tycoon is the best for killing the time. Thanks for sharing the reviews.